Good-hearted dreamer Larry Daley (Ben Stiller), despite being perpetually down on his luck, thinks he's destined for something big. But even he could never have imaged how "big," when he accepts what appears to be a menial job as a graveyard-shift security guard at a museum of natural history. During Larry's watch, extraordinary things begin to occur: Mayans, Roman Gladiators, and cowboys emerge from their diorama to wage epic battles; in his quest for fire, a Neanderthal burns down his own display; Attila the Hun (Patrick Gallagher) pillages his neighbouring exhibits, and a T-Rex reminds everyone why he's history's fiercest predator. Amidst the chaos, the only person Larry can turn to for advice is a wax figure of President Theodore Roosevelt (Robin Williams), who helps our hero harness the bedlam, stop a nefarious plot, and save the museum. Rocky Balboa (Sylvester Stallone) has now been retired for some time, but hard-up for money, he decides to step back into the ring against a few small-time boxers. 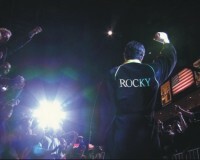 Everything changes, though, when Rocky is offered the opportunity to step in with the reigning Heavyweight Champion, Mason "The Line" Dixon. For Balboa, it'll be one last hurrah he'll never forget.....but with his glory days far behind him can he withstand the inevitabilities of what's to come? A look at going full circle and wanting more, when life turns out how you least expect it and then some.